I saw a praying mantis clinging to the screen of the house where I was on retreat last Tuesday. Wow. I’ve never seen one that close—and she was not totally still but was moving all over that screen. It was truly a visitation: As soon as the mantis realized she had my attention, she became very still again—and when I left and returned, she had disappeared. I can count on one hand the times I’ve seen a praying mantis in my life—and none were totally brown (camouflaged by the screen) as this one was. Well, of course I had to research praying mantis medicine. Surprise, surprise! It talked about stillness and the need for stillness, something that had been completely lacking in this year’s retreat/holiday. Normally I choose a place off-season on the ocean where I can go and completely unwind and relax. I spend a little time in the sun each day (not too much, as my skin does not like the sun), and then find a place in the shade to rock, do my spiritual practices, read poetry, nap, and just take in the lapping of the waves for most of the afternoons. I normally walk the beach and wade in the ocean toward the end of the afternoon when I won’t get burned and when the sun is beginning to set. Well, none of that happened this year. I couldn’t return to the place I had rented because Hurricane Florence had swept through just before. The island where I have been staying the last three years is not open to renters yet and will not be for some time. But then I received a wonderful offer from a friend to stay in her family’s house on the beach. Truly a dream come true—a miracle! Except. During the first four days people were in and out of the house for various reasons—and I had no rest. On the third day it finally stopped raining, and I discovered that there is significant new construction happening next door, less than six feet from the end of the house where I’m staying. So not only was there constant traffic from the workers coming and going in the house, but lots and lots of noise coming from next door. Most of you know I’m not a morning person by any means, and the power saws and hammers started revving up around 8:30 a.m.! I talked with the workers and negotiated a time when I could sit on the deck in peace and quiet—during their lunch break. But the day I wrote this, they decided not to take a break but continue working! Stillness, quiet, a time for introspection has not been available here. To be quite honest, on that third day I was not in a good place. First, some workers showed up at the house where I am staying, without notice, to do some work that could have waited two weeks, and they scared me to death when they woke me up by clomping around on the deck outside. By the time I figured out what was going on, they were already deep into the project and had to return the next day to finish it! That was also when I learned about the non-stop hammering and pounding and machine-sawing next door. I have to tell you, I went to that pissy place for a few hours! I even cried a few tears. But then, I knew I had a choice. I could let the situation completely ruin my retreat or I could let go of my expectations and accept it for what it was: truly a miracle situation (What an amazing gift to be offered a place, at the last minute, on the ocean, for the just dates I needed!). Did I get tons of rest? No. Did I get that wonderful quiet downtime where all I hear is the rolling of the ocean as its ebb and flow works a deep peace in me? No. However, I did get so many gifts: the gift of giving up my expectations; the gift of dealing with the place where I am on my own spiritual path where that peaceful downtime was not truly what I needed. I was given the gift of situations that triggered frustration and other emotions that allowed me to get at some similar storage I am working to clear right now. Most of all, I was given the gift of polishing my surrender again and again. My challenge became to find that stillness even in the midst of the sawing and hammering. Praying mantis was a reminder that the stillness doesn’t have to exist only in the external environment. In fact, the mantis will remain motionless until it is 100% sure that its next move will succeed. It doesn’t matter what’s going on externally. It watches and waits for those internal cues. I’m reminded that the spiritual path is one of continual polishing of surrender, that expectations inevitably bring disappointment and suffering, and that in the end we find our stillness in community with the Divine and internally—even in the midst of the swirling of life. Given what is happening around us, the exploitation of hate and fear and the injustices happening in so many places (to name but two in my own culture: tent cities set up to house migrant children who have been separated from their parents by the US government, and the travesty of justice in the hearings of Supreme Court nominee Brett Kavanaugh), it is more important than ever to learn to do our spiritual work in the thick of things, to give up our expectations, and to polish our surrender. I challenge you, as I was challenged, to find your spirituality not necessarily or only by retreating or pulling away, but rather smack in the middle of the noise and difficulties of daily life. 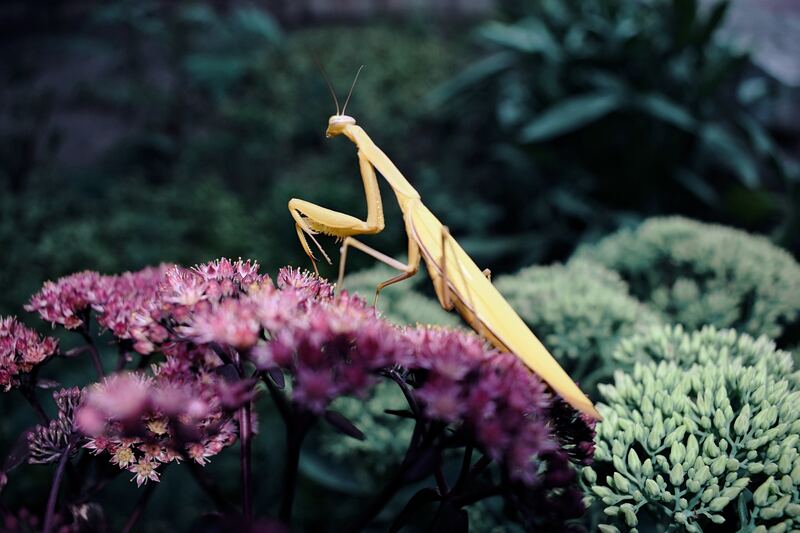 What does praying mantis medicine offer to you in the situations you find yourself in today? Where can you accept what is, and find the stillness within, and polish your surrender? If this sparked you and inspired you on your spiritual journey, and you want to learn more, please click here to book a free consultation.